Bendigo hosted about 350 tourism leaders, professionals and operators from the state’s tourism industry, attending the Victorian Industry Tourism Conference in Bendigo on 25-26 July. The two-day conference was held at the Ulumbarra Theatre in Bendigo, with nearly 30 local, national and international speakers. This year’s theme, “Experience Evolution”, encouraged reflection on where the industry had come from and what it needed to do into the future to respond to changing desires. 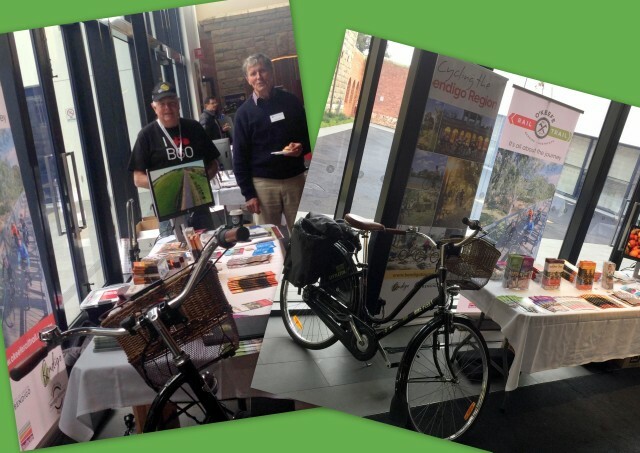 The Friends of the Bendigo-Kilmore Rail Trail volunteers took the opportunity to provide information and a display at the conference, to show case various cycle tourism attractions that focussed on the Greater Bendigo. The O’Keefe Rail Trail, Great Rides of Bendigo, Bendigo Mountain Bike Park, Goldfields Track (Victoria), Bike Bendigo, were some of the cycling attractions highlighted, which created a deal of interest from attendees at the conference. It was all about Bendigo, ‘the City of Greater Cycling’!